This book offers a critical analysis of consumer credit markets and the growth of outstanding debt, presenting in-depth interview material to explore the phenomenon of mass indebtedness through the life trajectories of self-identified debtors struggling with the pressures of owing money. 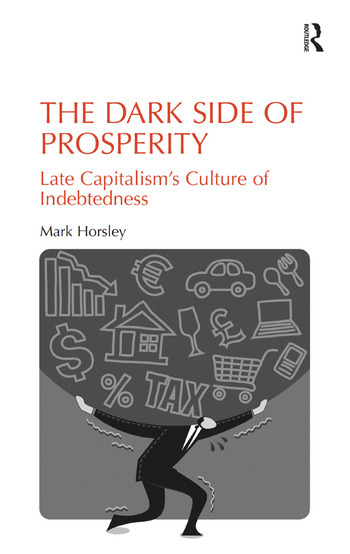 A rich and original qualitative study of the close relationship between financial capitalism, consumer aspirations, social exclusion and the proliferation of personal indebtedness, The Dark Side of Prosperity examines questions of social identity, subjectivity and consumer motivation in close connection with the socio-cultural ideals of an ’enjoyment society’ that binds the value of the lives of individuals to the endless acquisition and disposal of pecuniary resources and lifestyle symbols. Critically engaging with the work of Giddens, Beck and Bauman, this volume draws on the thought of contemporary philosophers including Zizek, Badiou and Rancière to consider the possibility that the expansion of outstanding consumer credit, despite its many consequences, may be integral to the construction of social identity in a radically indeterminate and increasingly divided society. A ground-breaking work of critical social research this book will appeal to scholars of social theory, contemporary philosophy and political and economic sociology, as well as those with interests in consumer credit and cultures of indebtedness. Mark Horsley lectures in the Department of Law and Social Science at the University of Cumbria, UK.